· Coordination, scheduling and planning. · Surveying, clearing right of way. 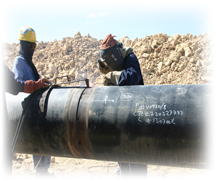 · Pipes transportation, pipes support casting. · Trenching road crossing, concrete casting and installation. · Stringing, welding and NDT. · Pigging, hydro testing, de-watering and cleaning. All Rights Reserved For HTC.